Pastebin is an online repository of text based data. It was founded in 2002 and it has 1.7 million registered users by now. I am sure millions using it without registering. So you have an idea about how popular this particular website is. People use it store text or code snippets or bigger text based data which can easily be shared to anyone else just with a link. When you create a paste, it gives you a short URL (click here to read about URL shorteners) which you can share with your friends or clients to show that particular paste. The Owner Jeroen Vader says that Pastebin is an effort to make it easier for people to share large text document online. There is no doubt about the popularity of Pastebin but it also became a primary tool for hackers as they can anonymously host malicious codes and stolen information. You can check out pastebin.com to know more about it by doing things practically over there. Now as you know that in this online world there are always a lot of alternatives scattered for everything and so with the Pastebin, there are so many similar kind of online tools which offer similar services. The first on my list is Tinypaste which is as simple as a click. Go to its home page, type your paste title and write or paste the content in the container, Format the text as per your requirement. If you want to set password protect your paste then you can do this too, now click on submit, get the link and share it with whom you want to. Tinypaste also offers you to ON or OFF the code highlighting. As said above you can format the text as well which is one of the unique features of it. The second one is Cryptbin which is also a cool one. Just name your paste and write content. You can drag the bar just above the create button to fix the timing of the paste destruction. Means if you set the time for 4 days, then the paste will auto destroy once 4 days will be gone.Â There are so many features given by this website which you can check by clicking here. The third one is pastee. The name itself describes its work. The interface is very simple. Write the content or paste in the container, give it a title. Select the required option from Syntax Highlighting option, set expiration time, set it public or private, add tags if you want then submit and get the link to share with your friends or to whom you want. The fourth is Hastebin and I am in love with it because of its simple and eye soothing interface. So simple yet effective. You cannot set a time limit for your paste to destroy. All the paste you create stays for 30 days from your last view. Chopapp is fifth on the list. Its interface is also a simple one. This is a product of Zurb â a product design company since 1988. You can paste codes of different languages which you can see in the screenshot. 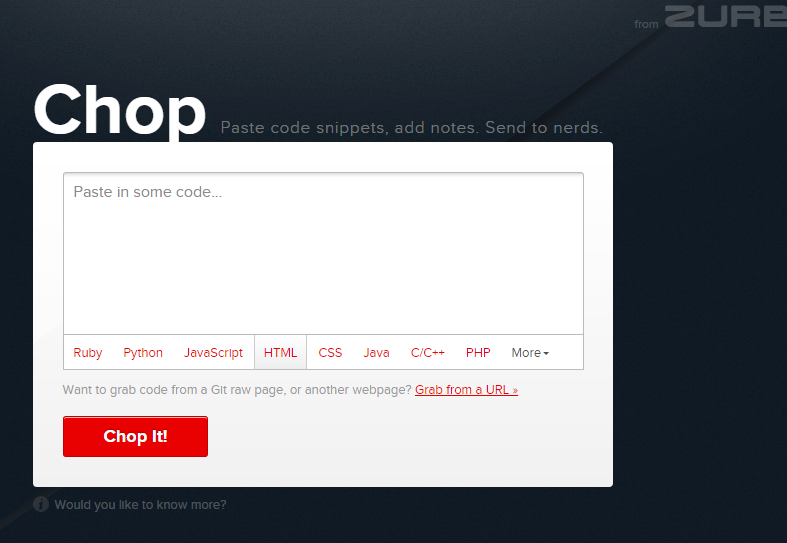 If you want to paste a code from a URL then just click on Grab from a URL and paste the link and click on Chop It! Button. Gist is sixth on the list . Github is a famous website and this tool is being offered by it. The best thing is that each gist you create also works full-fledged Git repository. Syntax highlighting feature is also there in its user interface. As a registered user all the gists get linked to your account. P.ip.fi is seventh on the list and itâs the simplest one. Just write and press ctrl+s to save and get the link to share with others. What Makes Internet Marketing Popular?